By default, after installing and setting up Shibboleth SP, the /etc/httpd/conf.d/shib.conf file will contain a control to handle requests to www.example.com/secure. 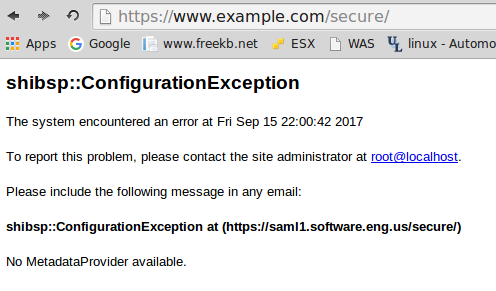 Navigating to www.example.com/secure will display shibsp::ConfigurationException. In the /etc/shibboleth/shibboleth2.xml file, in ApplicationDefaults, set entityID to the hostname of your SP. <ApplicationDefaults entityID="https://<hostname of your SP>/shibboleth"
In SSO, set entityID to the hostname of your IdP and delete discoveryURL="https://ds.example.org/DS/WAYF". <SSO entityID="https://<hostname of your IdP>/idp/shibboleth"
Remove the comment from MetadataProvider, and adjust the file to point to the location of your idp-metadata.xml. This assumes that the SP and IdP are on the same server. Ensure there are no syntax errors in the shibboleth2.xml file. Restart the SP and web server.